The Best of Teacher Entrepreneurs III: Misc. Lesson - "food groups"
I am thinking about the special days that we celebrate with our students every year and am looking ahead to the next several observations. In recent weeks, we've celebrated the one hundredth day of school, Valentine's Day, Dental Health Month, and the birthday of Dr. Seuss. One thing that I often neglect to observe is "National Nutrition Month". "National Nutrition Month" takes place in the month of March. Usually, it's not a big event in the classroom. Yet, I want children to form healthy eating habits that they will take with them throughout their lives. I want them to make informed choices about the foods they are putting in their mouths. I DON'T want them to be consuming foods that are filled with empty calories. How can I help them to do that if they are not taught the basics of proper nutrition? Back in the "Good Old Days" health lessons were part of the curriculum. The emphasis now is on the core subjects of math, language art, science, and social studies. It seems that the subject of health is getting neglected more and more. While I might not have the time to spend on an extensive unit about nutrition, there are a few easy things that I can do. I can talk about the foods we are eating from the school lunch menu. I can bring in magazines with photographs of foods. I can allow the children to cut out the pictures from the magazines and create a "Food Groups" collage. I can use educational websites to present information about healthy food choices. 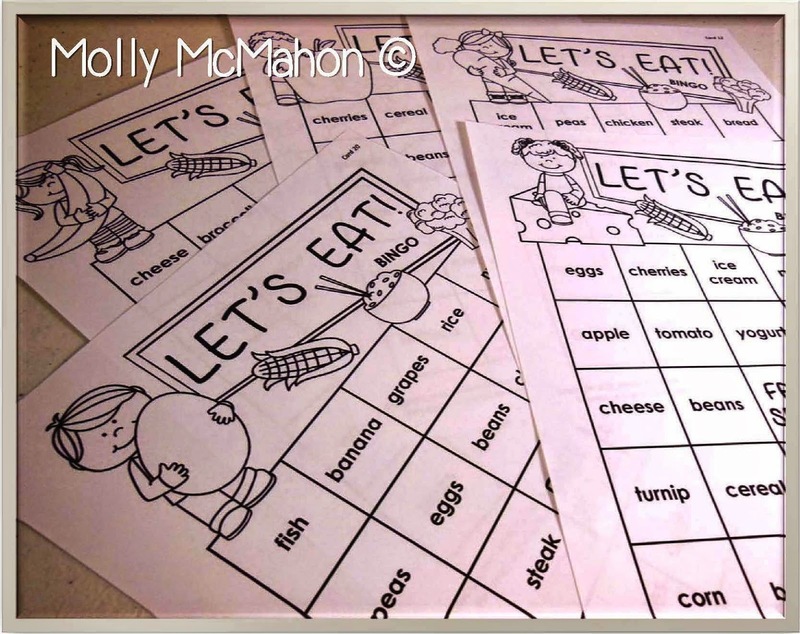 I made a few nutrition themed bingo games which are available at my Teachers Pay Teachers shop. The one shown in the photo below uses BLACK ink from a printer. 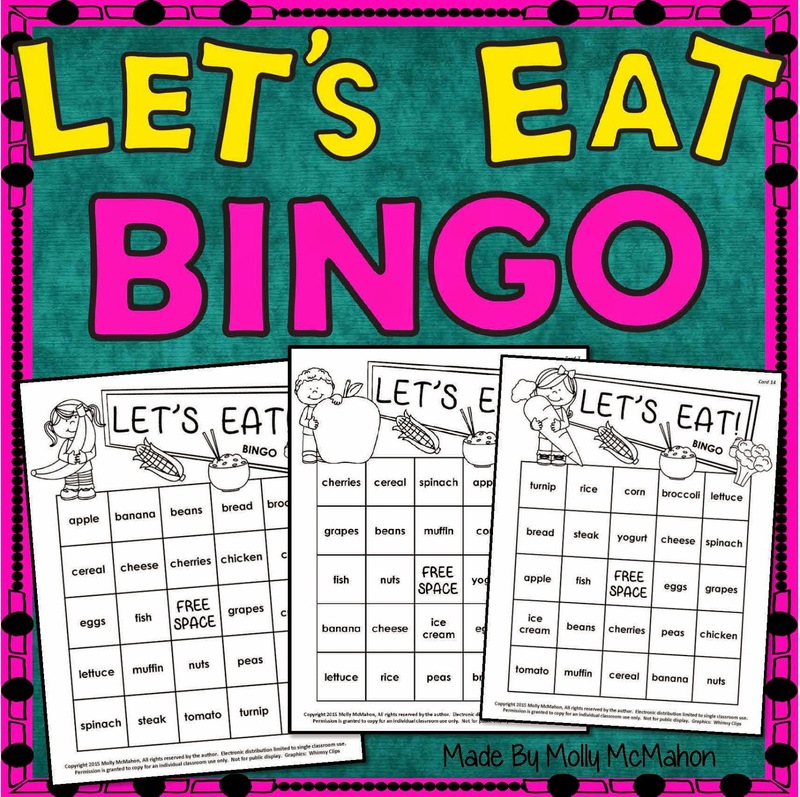 There are 25 unique bingo cards included. Each card has 24 foods which are from the FIVE main food groups. 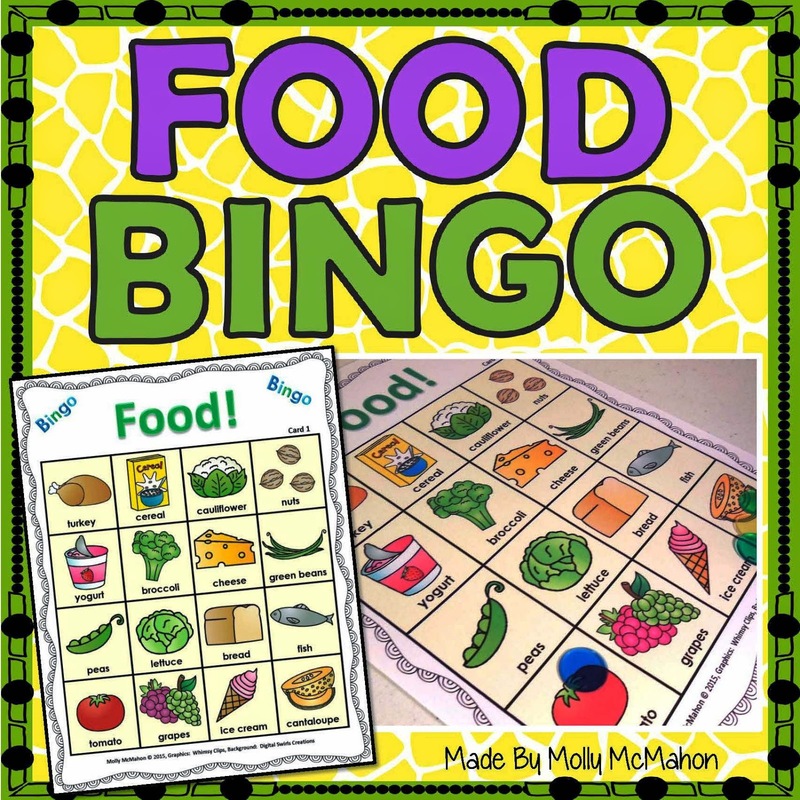 All 25 bingo cards use the same 24 foods. This avoids confusion! The children know that they MUST find the word that is called out. There is a free space in the center of the bingo card. When the game is in play, the words can be covered with bingo chips, paint daubers, or small objects such as plastic cubes. I have included a variation of the game. Call out the food category instead of the name of the food. This way, the children will have a choice as to which food to cover within a food group. They will learn how to play strategically in order to win bingo. With this version of the game, they will need to have an understanding of how foods are grouped to play the game efficiently. The calling cards include the name of the food as well as the food group that it is categorized with. If you are interested in purchasing this game, click on the image below to view it at my Teachers pay Teachers shop.